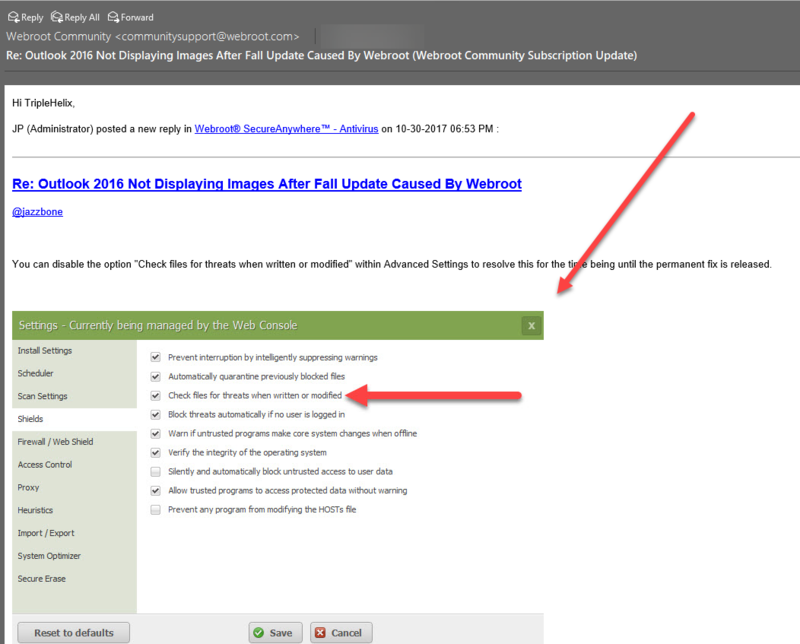 As title says, since the fall update if I have webroot active Outlook 2016 will not display external images. 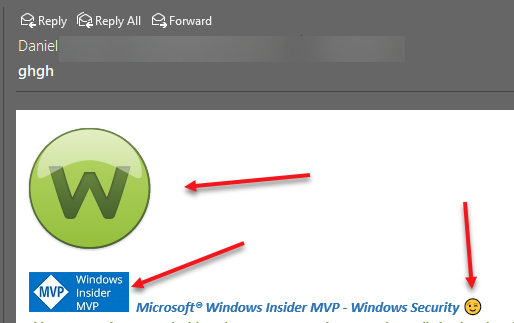 I just get the Outlook cannot display the external image placeholder. If I manually terminate webroot and restart outlook it works fine again. It must be protecting the Temporary Internet Files folder in INetCache as this is where the Outlook images are stored. Can someone confirm and if there is any temporary fix that would also be nice. I've also had the same problem as well hopefully it can be fixed easily. I have Outlook 2016 and the Fall Creators Update and I don't see any image issues. 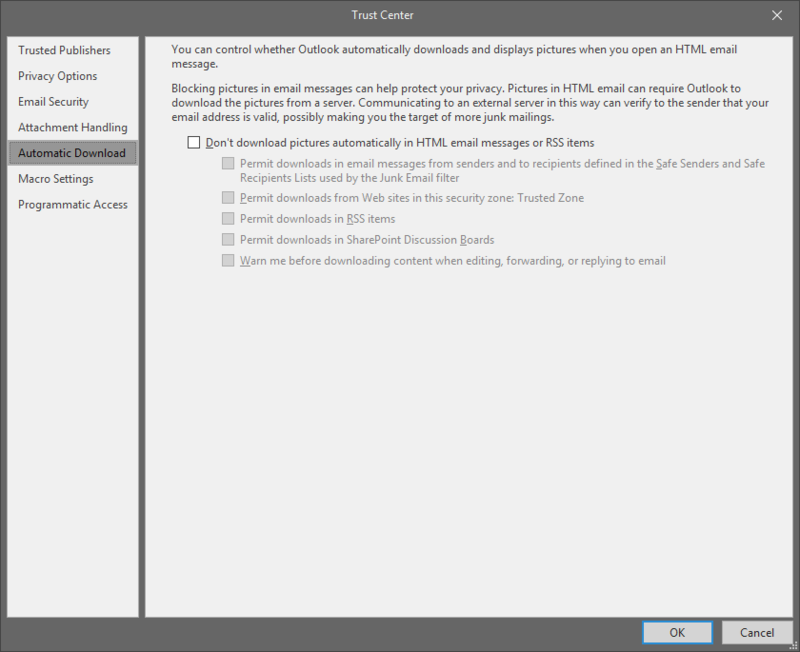 Maybe check the Trust Center within Outlook 2016. I am having the same problem, but only after opening Outlook 2016 for a second or more time. If it is the first time I open Outlook 2016 it works fine. But then subsequent openings cause this problem unless I turn off Webroot. Like you it did not start until the Fall Creators Update. Can anyone post some pictures? I don't have the issue. Also has anyone Submitted a Support Ticket? Yes, rather strange both the Pcs I was having the problem with Outlook seem to have fixed themselves over the last couple of days, no problems with images mails at all now! Very odd indeed as I never seen any issues. Glad yours is fixed! I have had this problem starting immediately after the fall windows update. I've tried everything I could find. Finally, I came across this post. I disabled Webroot and the problem went away! Please investigate. I don't want to disable Webroot permanantly. @jazzbone I still see no issues so it can't be WSA but if you like Submit a Support Ticket and see what they say. You can disable the option "Check files for threats when written or modified" within Advanced Settings to resolve this for the time being until the permanent fix is released. This is my settings and I see no issues. And even from a reply email to this thread! Making that change (disabling 'check files for threats when written or modified') worked perfectly to solve the issue for me on multiple machines - thanks! After the Fall Crators Update, I had the Outlook image problem, and I also had a problem with Roboform (password manager) syncing. When I heard about disabling and then restarting Webroot to solve the Outlook image problem, I started doing the same to get Roboform to sync. It worked. I just came across this thread and the "uncheck the box" solution which people say fixes the image issue, so I have unchecked the box. Unfortunately, I just had a Roboform sync failure and unchecking the box did not fix it - I had to shut down Webroot protection and then restart Webroot in order to sync. EDIT: Just read the poet immediately below. I have not rebooted, so that's likely my problem. We Beta testers just got a new version to test to fix these issues with the Windows 10 Fall Creators Update so hopefully they will push it out to everyone soon after some testing. While I (and some of my other clients) have this problem with Outlook and images not displaying after Fall Creators Update (1709), some clients do not have Webroot, and are experiencing the problem. I would like to know what the root problem is...is it the iNetCache folder being "over-protected" by any AV, even Defender, or what? While I use Webroot Secure Anywhere managed console for my clients and have changed the policy to not check modified files and folders, i'm not sure what to do for clients not using Webroot. Update: As embarassing as it is, I have to say that the client with the "issue" that didn't have Webroot was just because the Trust Center setting was not changed. I had become so sensitive to this Outlook problem I failed to check Trust Center on this non-Webroot PC. So, as it stands, the systems I have seen the problem on have Webroot. What version number should we be looking for to know that the fix has been implemented? When will this new 9.0.18.44 version be publicly available and be pushed out? We are on a business deployed version and it is still listing the 9.0.18.34 version.